One Sunday in February, 2008 when my wife and I were living in the bairro of Itapúa which is situated near the airport of Salvador, I was home alone. My wife left out early that day to visit with friends. It was a normal Sunday like so many other Sundays, bright sunshine, blues skies, birds singing in the distance, quiet and peaceful. I received a telephone call from a friend that asked if I would like to attend a festival at the house of his sister. At the time, I did not know that my friend’s sister was a devout follower of Candomblé and thought that it was simply a festival like other festivals that occur in Brazil at this time of the year. I explained that I was waiting for my wife to return and was not sure if I should attend. In turn, he placed a call to my wife to ask her if it would be alright for me to attend and that they would swing by our apartment and pick me up.Of course, she replied that it would be good for me to experience more of the cultural side of Brazil. So, they made arrangements to pass by our apartment and pick me up to accompany them to the festival. When I arrived at the home of my friend’s sister, the first thing that caught my attention was a group of drummers vigorously playing music, singing and dancing in the street in front of the house. I stopped for a short time to listen and tried my best to blend into the crowd and not appear like a gringo (foreigner). As I entered the house, I could see that the house was filled with people, children playing, running back and forth, people sitting in the sala (living room) watching television, people sleeping in other rooms, and a kitchen filled with women cooking, talking, laughing and making food preparations for the festival. After brief introductions, I could see that on the table in the kitchen, there was a wide assortment of the traditional Brazilian drink Cachaça (white rum). There were different types of liquor gene poppa, caja, maracuja various types of cachaça mixed with fruits, caipiroska (a drink made with vodka), juices, and mineral water. My friends asked me if I would like to sample some of the different types of Cachaça. So, we sat down and began to drink a little. I had only two or three small drinks because I did not want to get drunk before the activities. After a short while, I went into the sala of the house to sit down and watch some television. More introductions ensued as people continued to arrive. After about an hour or so, I went back into the kitchen and was offered something to eat. At this point, the next thing that caught my attention was how the food had been prepared. I noticed that they did not prepare the food in the customary way of comidas Baianas (Baiana foods). I could not smell any seasoning or saw any on the food. In fact, most of the food had been boiled rather than fried, char-broiled, or stir-fried as is the custom in many homes and restaurants in Salvador. As I sat down to eat, I looked for a fork and knife to begin eating but noticed that my friend, his wife, brother-in-law and few other folks had a slight sort of grin on their faces. No one made an attempt to explain to me about the Candomblé customs regarding how to eat food. So, I commenced to eat with my knife and fork. Almost immediately after I began to eat, one of the nephews walked into the kitchen and began yelling at me in Brazilian Portuguese “mãos, mãos, mãos.” Well, I knew that “mão” in Portuguese means “hand” but I could not understand why he felt it was necessary to yell or why there was such urgency in communicating this to me. It was here that all my friends began to laugh very loudly as though a joke had been played on me and I was totally unaware of it. Afterward, my friend explained to me that in Candomblé they have very liturgical rules for cooking and food preparation. Also, they have very traditional rules for the manner in which food is eaten. He went on to explain that the Candomblé do not use western instruments for eating such as knives, forks, or spoons. Instead, they eat with their hands. This is considered a cultural reflection of the manner in which Africans ate for centuries. There are many representations of religious syncretism in Brazil and in Bahia three of them Candomblé, Macumba Ritual and Jaré are widespread. 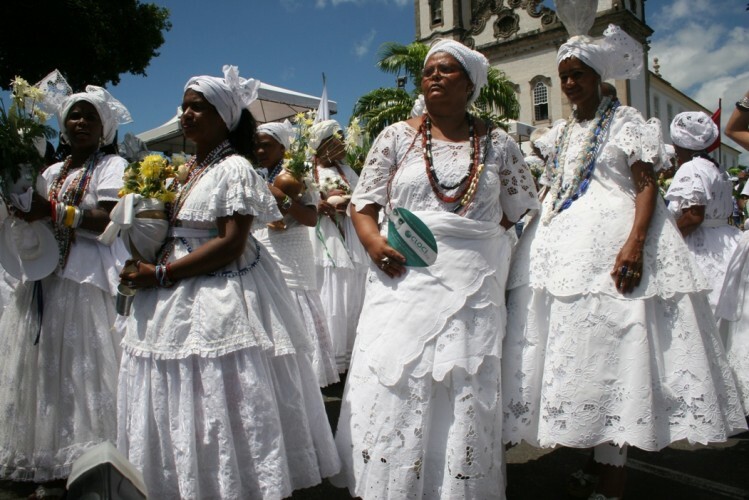 Candomblé should not be confused with Umbanda or other African based religions such as Haitian voodoo, Cuban Santeria, and Obeah, Trinidad and Tobago. 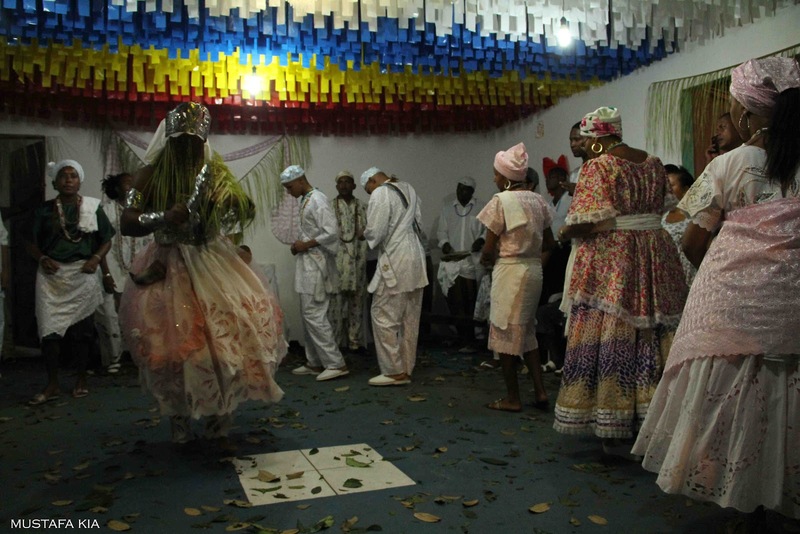 The name Candomblé originally came from the Bantu term Kandobile, which means a place of worship and prayer however, the religion is expressed differently depending on the dominant ethnic group practicing it. The manner in which an established religion such as Roman Catholicism or Protestant Evangelicalism and the African religions of Candomblé, Macumba Ritual and Jaré are able to co-exist side by side in the same socio-cultural space without conflict is particularly interesting. In fact, these religious organizations seem to emphasize and maximize the spirit of cooperation and humanistic exchange toward one another with a profound commitment and labor on behalf of one another. The combination of different forms of belief and practice have been widespread in Brazil since the early 16th century and occurred in part because of religious persecution and the compatibility of different belief systems. It is estimated that between 4 and 4.6 million Africans were forcibly taken from Africa to Bahia before slavery was abolished. Many of these slaves set foot on Brazilian soil for the first time in Salvador, Bahia, however others were off loaded directly at tobacco, coconut and sugar cane plantations along the shores of the city. Not only did the slaves with their chants and rhythms modify the social culture of Brazil but they also played an important role in shaping its religious landscape. Candomblé, Macumba Ritual, and Jaré were brought to Brazil predominately by the slaves from Nigeria, Togo, Benin of the West Coast of Africa and it was practiced around Salvador where the slave ships first landed. These slaves came from the Massai, Jeje, Keto and Nagõ nations and were the main practitioners of Candomblé while the Bantus comprised the nations of Angola, Bengal, Cabinda, and the Congo. Upon their arrival, slaves were typically baptized by the Roman Catholic church and their native practices were suppressed. However, the slaves developed a novel way of keeping their old beliefs alive by equating each of the gods of their traditional religion with a corresponding Christian saint resulting in a set of deities with characteristics of both religions. Also during the 16th century, Candomblé was practiced by the Yoruba of Bahia and spread to many other states in Brazil such as Rio de Janeiro and Pernambuco and eventually developing an outstanding presence throughout the entire country. Still practiced today, it is a religion that is based on the worship of orishas, inquices, voduns or African gods associated with the forces of nature, earth, fire, water, and air. It is said that Candomblé, Macumba Ritual and Jaré share the same religious ideology in the manner that each incorporates and invokes its gods by mães and santos (priestesses and saints) in the hundreds of casas (temples) that are scattered throughout Bahia. Typically, denominations in Candomblé are defined as nations. Each nation has its own distinct religious terms, names of food, clothing, gods, chanting and rituals which indicate the different types. In Bahia, it is practiced by three distinct nations, Ketu-Nago (Yoruba), Angola-Congo (Bantu) and Jeje (Fon/Ewe), and the Candomblé Caboclo, considered Brazilian in origin. There is also a vast amount of indigenous cultural knowledge that includes cooking, botany, handicraft, dance, music and other symbols that make up their systems of faith and expression. In its design, the nations of Candomblé represent a very traditional form of cultural preservation. Equally important, Candomblé is considered animistic and ecological in nature. That is, its worshipers believe that all things in nature have a spirit and they are concerned with the balance between humankind and the spirit world (deities). Consequently, they believe that there exists a space between the Aiye (material world) and Orum (the spirit world) that is occupied by deities, inquices or voduns. This is followed by the belief that the religion is divided into three distinct evolutionary stages. The first is defined by the belief that there is a spiritual life given to natural elements. For example, a simple stone may be given a spirit that is responsible for its movement and mood. The second stage results from the connection of these elements with routine skills and crafts of specific groups. These are planting, cultivating and harvesting, pottery making, knowledge of roots and herbs, the manufacture of metal artifacts, the location of springs, fishing, boating and animal hunting. The third stage is represented by the fusion between deities and ancestors, that is, those ancestors of the tribes that were distinguished such as patriarchs, hunters, kings, potters, diviners, priests, messengers, blacksmiths, and fishermen. In turn, these ancestors merged with the deities connected with their offices or specific knowledge.Hence in Brazil, this process continues through both oral and ritual practices and has become more complex resulting in multiple classifications in terms of pedigree, color, gender, days of worship and types of rituals. Source: Turner, N. Religious Syncretism in Brazil: Catholicism, Evangelicalism and Candomblé. Munich: Grin Publishing, 2011. Photo: Festa de Irmandade de Nossa Senhora da Boa Morte (Festival of the Sisterhood of Our Lady of the Good Death); Courtesy: Arquivo Setur-Bahiatursa, Rita Barreto and Jota Freitas. Thanks for the tip. But my wife is Baiana and is an excellent cook as well. She knows how to mix caipirinhas and many other Brasilian drinks. Thanks for checking out the website. Your experience was beneficiary to your career. Most of the practices in the story are/were very very similar to other parts of the world (definitely). My question is, What have you learned or noticed most powerful and important substance or element in that cultural practice? To begin with, thank you for taking the time to read the article. Before I respond to your question directly, I would like to first state that I have personally had two very frightening experiences relative to the force and power of Candomblé. These experiences are quite difficult for the average person to comprehend – but they demonstrated to me the power of this religion. Notwithstanding, they happened and they unequivocally convinced me of this religion’s authenticity. Now, to answer your question, I have learned that “resilience” is an important substance of this cultural form. This religion has endured centuries of assault on its integrity and despite that, it continues to maintain its internal consistency as a cultural form. Dear Mr. Turner, thank you for sharing your story! Loved reading, but wished you’d share more of what happened next… and YES!! Of course what you experienced was “Frightening” — that was the work of the devil. This is nothing but a satanic cult worshipping false “gods” — there’s ONLY ONE True God and HIS Name is JESUS!! The devil wants everyone to worship him; but the worship belong to GOD ONLY — the Only True LIVING GOD–JESUS CHRIST! Who died and resurrected so that we may have eternal life in HIM and through HIM. For God so loved the world (everyone!!!) that HE gave his only Son that whoever believes in HIM will not perish but have Eternal Life!! Jesus said “I am the way! (there’s no other way!) I am the Truth (everything else is a Lie from the devil to deceive people from the true living God– JESUS! ); and I am the Life (all other lead to eternal death while Jesus gives us eternal life in HIM); No one comes to the Father except through me (yes, through Jesus)” Thank you! I sincerely hope that with your wisdom and wonderful way of writing you will find the TRUTH (JESUS) and you will write about it! God bless you!! What a great read, and really cleared up some things for me. I have been to 2 Macumba rituals in Brazil and they.. were.. interesting.. =) Fun times.